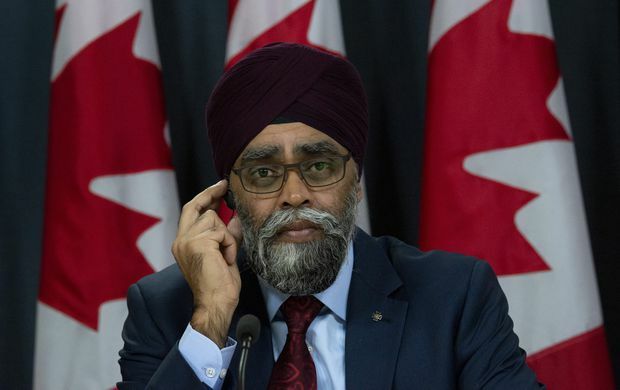 Minister of National Defence Harjit Sajjan listens to a translation during a news conference in Ottawa, on April 8, 2019. Mr. Sajjan’s promise to examine the gaps in the historical record about one of the most difficult deployments ever undertaken by Canada came Monday as politicians acknowledged the 25th anniversary of the massacre that claimed more than 800,000 lives. Six hundred Canadian soldiers – signals experts, engineers, medical staff and members of the now-disbanded Canadian Airborne Regiment – were sent to the tiny African country in July, 1994, as the slaughter was ending but a civil war was still being waged. They were the among the first troops to arrive as part of a mission, known as UNAMIR II, that began with a United Nations Security Council resolution on June 8. The Canadians patrolled streets lined with bodies under uncertain rules of engagement, helped children who had been orphaned and people who had been maimed, and faced down child soldiers armed with machine guns, while creating the communications and infrastructure that would allow Rwanda to heal and rebuild. Today, more than half of Canada’s Rwanda veterans are receiving disability benefits related to post–traumatic stress disorder (PTSD) – more than double the rate for deployments to Afghanistan, Bosnia or Somalia. But, the Department of Defence website, which lists all of the missions undertaken by Canada, does not mention theirs. The Veterans Affairs site says Canadians stayed on after the genocide to help with humanitarian efforts but it makes no reference to UNAMIR II and what was endured and accomplished. And, while Australia has created a separate medal to acknowledge that its troops who were sent to Rwanda after the genocide faced brutal and “warlike” conditions, Canada has paid no similar tribute. Green Party Leader Elizabeth May rose during Question Period in the House of Commons on Monday to ask about the lack of recognition for Canada’s Rwanda veterans. As for a special medal, the minister said it would be up to Governor-General Julie Payette to decide whether one should be awarded. Ms. Payette is in Rwanda this week to mark the genocide and to demonstrate Canada’s commitment to preventing mass atrocities. Sammy Sampson, a former corporal who in 1994 was part of a four-man team at Canadian outpost at the Rwandan border with Zaire, says many of the Rwandan veterans wish they could revisit the country this year to see the progress over the past quarter-century. It is a request they had when The Globe and Mail wrote about the issue in January. It was difficult, said Mr. Sampson, for them to see the Governor-General go to Rwanda without bringing along any of the regular soldiers who helped put the country on the road to recovery. Also difficult, Mr. Sampson said, is the fact that many veterans hid the psychological issues they were experiencing in the years after they returned home and, as a result, did not apply to the government for benefits until 2006. That means they fall under the New Veterans Charter, and not the old Pension Act, and are receiving less compensation than those who applied earlier. But the key to moving forward is recognition, Mr. Sampson said. In the days and weeks after the Globe and Mail story ran in January, he said, he contacted Mr. Sajjan’s office as well as a number of senior military officers to provide them with the numerous documents he has collected about the UNAMIR II mission – information that at least could be used to update the government websites.